Ok, I get free books from Thomas Nelson Publishers, because I take part as a book review blogger. Usually, the way this works, I read a book, post the review, look through available books, and pick the next one I want. 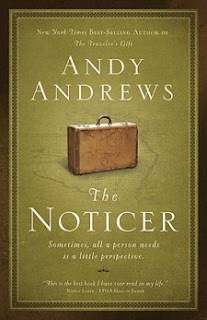 Then, one day, I got an email from the blog review department, announcing they had a special project to get a limited number of reviews for Andy Andrews' next book, The Noticer. The email raved about how this was his next book, all of his accomplishments, and so on. It sounded great. Well, except for one minor detail. I've never heard of Andy Andrews. Really. I don't try to live in a bubble, but UPS wasn't a hotbed of motivational speaking, and the Baptist world is, shall we say, a little over-hero-worship oriented, and he's not a Baptist hero. So, not to be rude, but he hasn't made it into my world. Until now. The Noticer is a remarkable little book. The story contained within its 167 pages is well told, recounting the experience of a small Alabama town with a visitor. It's hard to give more summary without wrecking the experience of reading it, but I'll try. I think Andrews' point is that, many times, we falter before the challenges of life because we lack a good perspective on what is happening around us. Moreover, that we often neglect the people around us that can bring that perspective. He uses a charming story, some factual, some possibly exaggerated, and all of it compelling you to turn the page and read just a little more before you put it down. By the way, my favorite quote from the book? This one: "Remember, young man, experience is not the best teacher. Other people’s experience is the best teacher." The Noticer by Andy Andrews. Thomas Nelson Publishers. Buy it from Amazon, Wal-mart, Barnes & Noble, CBD, the airport bookshop, basically anywhere you can get a decent book! As I read this review, I felt like I could have written it. I, too, get "free books", got the same email, never heard of Andy Andrews, and found this to be a remarkable book. I just purchased The Traveler's Gift To find out what more I have been missing. I'm looking forward to getting some of his others. Also, probably going to give copies of The Noticer to our high school graduates. Maybe they can learn from other people's experience instead of having to do it themselves.